We look forward to celebrating our 30th Annual Golf Classic and hope that you can join us for this great cause. Proceeds from this tournament will go directly to benefit our current students in the form of scholarships. As is our tradition, we also continue to award good students who live the Code of the Golden Knight with merit awards. In addition, a large portion of the proceeds are allocated directly to the school’s Financial Aid offering to help facilitate a Catholic College Preparatory education for those who might otherwise not be able to afford it. We are grateful for your generosity; you have made this a successful tournament for so many years and we are blessed by your continued support and generosity. 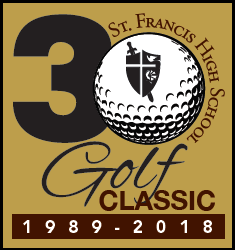 We hope that you, too, will join us again for a great day of golf, camaraderie, and fun…all in the spirit of St. Francis, and to help continue supporting the needs of our Golden Knights.